The U.S. Postal Service will commemorate the 50th anniversary of the first moon landing with a new pair of postage stamps. A new pair of United States postage stamps will mark the 50th anniversary of the first moon landing. The United States Postal Service (USPS) on Wednesday (March 20) debuted the art for its two new stamps commemorating the Apollo 11 lunar landing mission flown by astronauts Neil Armstrong, Buzz Aldrin and Michael Collins half a century ago. "In celebration of the 50th anniversary of the first moon landing on July 20, 1969, the U.S. Postal Service is pleased to reveal two stamp designs commemorating that historic milestone," the postal service described in a statement. The release date and the details for the Forever-denomination stamps' First Day of Issue ceremony are still to be announced. One of the two new stamps features an iconic Apollo 11 photo of Aldrin standing on the surface of the moon. Armstrong, as the photographer, can be seen in the reflection of Aldrin's helmet visor. 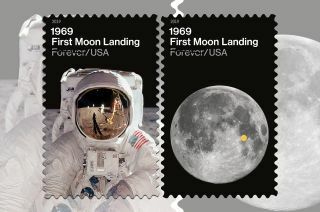 The other stamp in the pair uses an image of the moon captured by amateur astronomer Gregory Revera of Huntsville, Alabama. Tranquility Base, the landing site of the Apollo 11 lunar module "Eagle" in the Sea of Tranquility, is denoted on the stamp by a bold yellow dot. Both stamps include the inscription "1969 First Moon Landing." An image of the lunar module will be included on the selvage, or border, of the pair. USPS art director Antonio Alcalá designed the stamp art. The postal service (and its predecessor, the U.S. Post Office Department) has a history of honoring the first moon landing dating back 50 years. The first U.S. issue celebrating the Apollo 11 mission, a 10-cent "First Man on the Moon" airmail stamp designed by artist Paul Calle, was released on Sept. 9, 1969, less than two months after the triumphant return of Armstrong, Aldrin and Collins to Earth. The master die for the stamp was flown to the moon and back on board the Apollo 11 spacecraft. Two decades later, the USPS commemorated the 20th anniversary of the first moon landing with a $2.40 stamp depicting Armstrong and Aldrin planting the U.S. flag. Issued on July 20, 1989, the stamp was designed by Chris Calle, Paul Calle's son. Paul and Chris Calle were then commissioned to jointly create a pair of postage stamps for the 25th anniversary. The 29-cent and $9.95 commemoratives, each showing astronauts saluting the American flag, were released on July 20, 1994. Most recently, the USPS recognized the 30th anniversary of the Apollo 11 mission with a stamp issued as part of its "Celebrate The Century" program. The 33-cent stamp, titled "Man Walks On The Moon," featured an image of an astronaut's boot print in the lunar soil. It was released with other stamps celebrating the 1960s on Sept. 17, 1999.